This archive holds all posts form October 26, 2012. White Journalists Write 93% of Front Pages in U.S. The Maynard Institute has created this powerful infographic that illustrates the fact that white journalists wrote more than 93% of front page articles about the 2012 presidential election, according to a recent study by The 4th Estate. The data, from The 4th Estate, is collected from a sampling of news stories from US national print outlets, TV broadcast and radio transcripts covering the 2012 election. These stories are contextually analyzed and broken down by topic, sentiment and newsmaker. We have counted and analyzed the quotes and article level meta-data from all front page articles collected from a sample of 38 of the most influential print media in the U.S. market. We have researched and gathered the ethnic backgrounds of the journalists from publicly available information (Google, Wikipedia, LinkedIn, Twitter, Web bios). 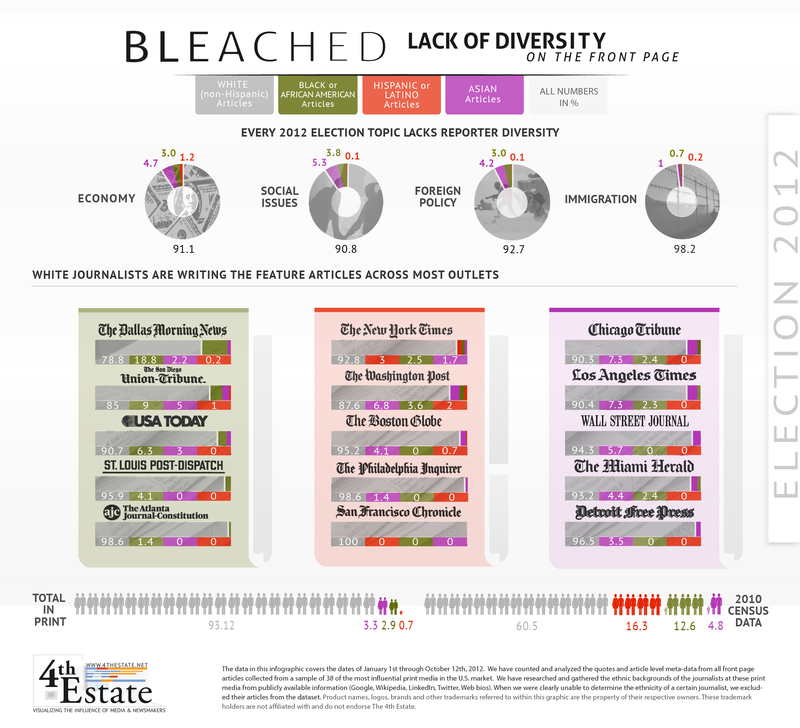 We have compared this data against an American Society of News Editors survey of the 2012 minority representation at various print organizations. The 4th Estate’s parent company, Global News Intelligence, provides similar proprietary services for government and Fortune 500 companies.